Pernille Frisvoll reviews a Horizon special on laughter. 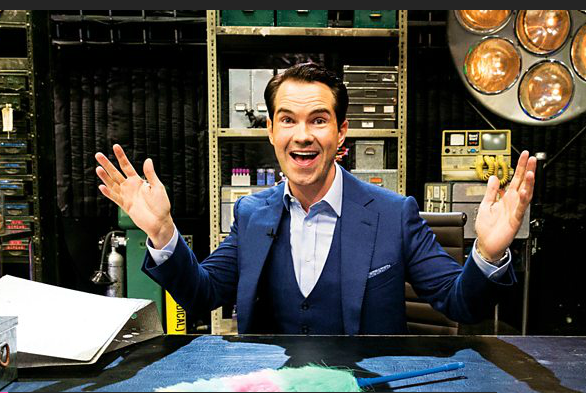 Horizon appeared in new dress this week, with comedian Jimmy Carr hijacking the presenter’s chair of the science-documentary-turned-comedy-talk-show set. Why do we laugh, he asks, and how does it relate to comedy? Carr opened the show by telling jokes in characteristically crude fashion and asking the audience their reasons for laughing. Reassuringly, he promised to ‘throw science at the problem’, having invited a trio of ‘laughter researchers’. First off was neuroscientist Professor Sophie Scott (University College London), teaching us that laughter is the opposite to breathing; your chest wall contracts repeatedly and squeezes air out of you to produce the laughing sound – ultimately killing you if going on for too long. Jimmy Carr quickly realised his potential as a deadly weapon and revealed his ultimate goal of becoming an assassin. Professor Scott argued that laughter is a universal phenomenon that completely defies culture. Where people in other cultures express emotions like triumph or sorrow in very different ways to us, and have vastly different ideas of humour, laughter will still look exactly the same. Professor Scott thus made a compelling argument for adding laughter to the list of basic human emotions along with happiness, sadness, anger, surprise, disgust and fear. But what is its purpose? It turns out the list is long, but all related to social interaction. An audience member put in isolation illustrated the fact that we are much less likely to laugh on our own. Additionally, Professor Sophie Scott revealed that a large proportion of laughter is posed for social purposes, displayed consistently and deliberately at the end or the start of a sentence. We were served the classic ‘which parts of the brain light up’ evidence [featuring Dr Catherine Loveday, University of Westminster and Chair of the Psychologist and Digest Editorial Advisory Committee, in the fMRI machine] to show that we use more of our frontal lobes when listening to posed laughter, as we are presumably engaged in social problem solving – monitoring whether other people are for instance mocking us or simply being friendly. Evolutionary psychologist Professor Robin Dunbar (University of Oxford) believes that making people laugh is the human equivalent of primate grooming, serving the social advantage of being able to ‘groom’ several people at once. This produces endorphins for both the groomer and the ‘groomee’, in turn promoting a natural high and mutual likeability. Professor Dunbar also theorised that laughter increases our pain threshold.. supporting the old saying that laughter is the best medicine. By asking four volunteers to sit in the painful 90 degree angle against a wall before and after laughing, he produced ‘proof’ that we are able to endure pain slightly longer after a laughter-induced endorphin high. Disregarding, of course, the likely powerful influence of social expectation and competitiveness in this scenario. Laughter is also the key to happier relationships, if we believe researchers at the University of North Carolina. Couples were filmed recounting the story of when they first met, and it was found that those who laugh more together report higher relationship satisfaction. This makes sense, however, it is entirely correlational – could it merely be that those who are happier together, or happier in general, laugh more as a result? This alternative explanation was not addressed. When it comes to comedy, people from around the world defined Britons’ sense of humour as satirical, and being able to laugh at themselves. Being an immigrant myself, I deem this self-deprecation as one of my favourite things about Britain. We also bore witness to the proposal of a grand, unifying theory of comedy by Professor Peter McGraw (University of Colorado), called ‘benign violation’. In essence, he said, comedy is pointing out what is wrong with the world and laughing at it – a timely statement to end on considering the state of the world right now. The Horizon special did make me laugh, self-consciously and analytically at that. But as the credits rolled to the sound of Carr’s unmistakable laugh, I felt left with little else but reaffirmation of widely known concepts. I found the lack of critical appraisal problematic – not because I think anyone would argue that laughter is bad for you, but for the lack of in depth discussion. Is laughter really the panacea that researchers promise? In any event, it is certainly the most enjoyable kind of cure - as long as you stop in good time! - Reviewed by Pernille Frisvoll, Assistant Psychologist in Chronic Pain Management. Watch the programme now on the BBC iPlayer. Read more about psychology and humour in our April 2013 'comedy special'.